Babylon Flats is one of those place names which has faded from use (at least where it once was), yet it dated back to the 19th century. It appears to have been the earliest European name given to the South Kaipara district, pre-dating McLeod's appellation of Helensville. According to C M Sheffield in Men Came Voyaging (1963, sec. reprint 1995, recently republished by Helensville & District Historical Society), Babylon was the Maori settlement at Otakinini, the main pa of Hauparoa of Ngati Awa in the lower Kaipara, early hunters of moa. The battle of Otakinini during the conquest of the area by Ngati Whatua from 1680 to 1730 "is considered to have marked the true conquest of Kawerau by Ngatiwhatua (sic)." The battle lasted three days, the pa falling when the defenders thatched huts caught fire. 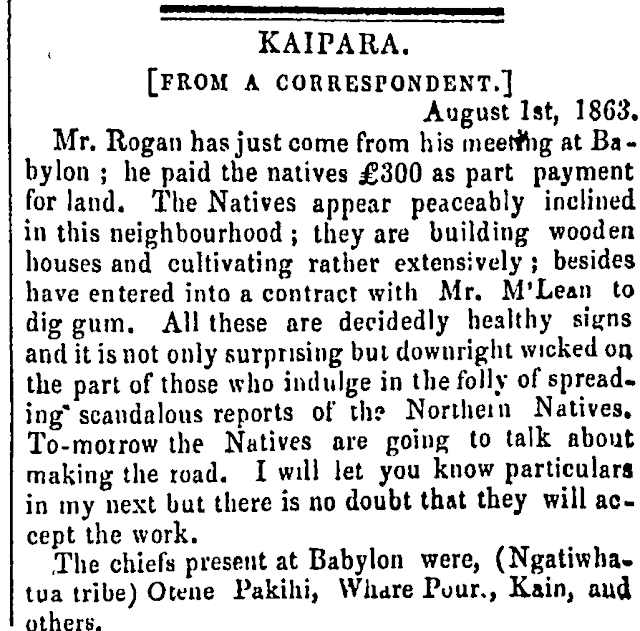 Otakinini was apparently visited by Reverends Whiteley and Buller of the Wesleyan Mission in 1839. William Colenso from the Anglicans visited the district in 1842. Sheffield is silent as to how the pa/settlement came to be known as Babylon, but successive visits by missionaries probably left their mark. Helensville itself is one of the most delightful spots, in this delightful district. It stands at the confluence of the Kaipara and Awaroa. rivers, and is surrounded on the east by a circular belt of high hills thickly covered with, bush except where the axe has laid low the dignitaries of the forest, which lie like so many bleached skeletons of trees, along the sides of the mountains as far as the eye can reach. To the west a level plain stretches away to the Coast range and comprising many thousand acres of alluvial land. On this there is a Maori settlement which consists of three houses several raupo whares, and rejoices in the pretentious name of Babylon. We believe its native citizens are staunch Maoris, good Christians, and very friendly. Mr Weetman's survey party are at work on three blocks of Government land at Babylon, a few miles beyond Helensville in a westerly direction. Mr Weetman has had to encounter some difficulty on the part of the natives who have tried to stop him proceeding with the survey. The cause of the obstruction was the sticking of a pole and flag in the middle of an old Maori burial place. The latter is still used by the present generation to bury their dead in, and this fact invests the sacred ground with still more sacred associations, and as the pole was stuck in about two yards from the grave of a Maori who was buried a fortnight ago, the natives are most earnest in their protests. The burying ground is not on Government laud, but it is situated on an eminence which forms a favourable spot for a trig station, and the surveyors merely wish to use it for that purpose, and cannot make the Maoris understand the alpha and omega of a trig station. They think that as the surveyors are at work with surveyors' instruments that it means taking possession of the soil, and the young natives have got up their backs at the surveyors, asserting that the work must cease. The surveyors have referred the matter to the authorities at Helensville. 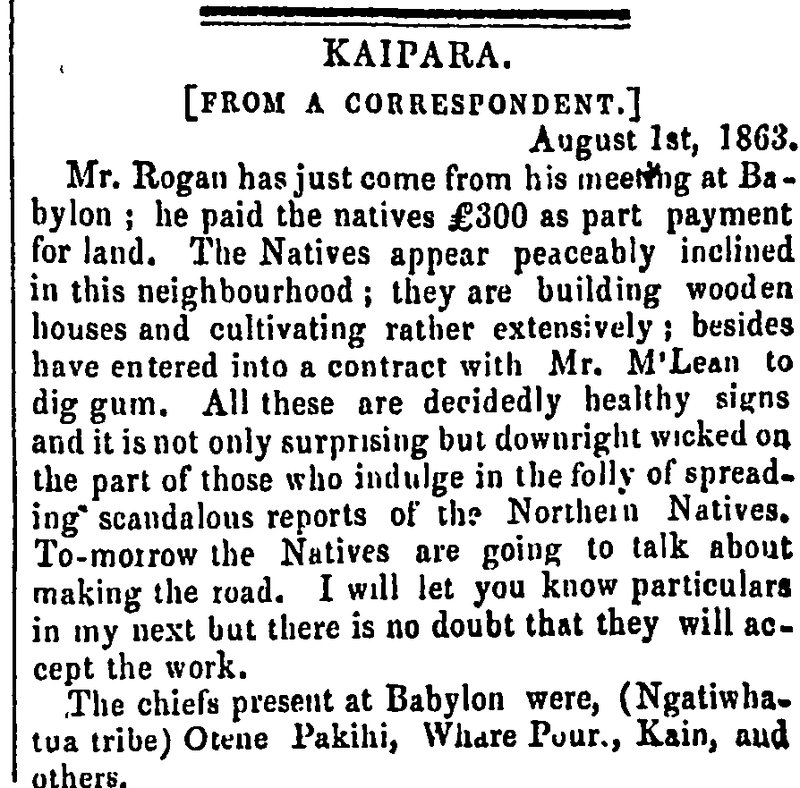 Mr Clendon has undertaken the important duty of settling this little native difficulty and in his able hands there is not the slightest doubt but the Maori mind will be enlightened, and under his soothing explanations, that they will allow the surveyors at Babylon to proceed with their duties. The surveyors urge that they are not bound by the Act of 1878 to keep off the burying grounds; at the same time they avoid giving offence as much as possible. Natives are very easily offended by interference with their sacred grounds; and the bare idea of a surveyor's pole being rammed into the earth in close proximity to the bones of their ancestors would of course get the Maori back up at once. Mr Clendon started this morning to see Hotene Kikokiko, and other chiefs on the subject. Perhaps one of the most gratifying features in and around Helensville is the increasing attention paid to the reclamation of the land from a state of nature, so that when the timber is done with agriculture will replace it as a means of livelihood. In and around the township there is about 2000 acres under grass. Besides this a large area is in process of being cleared across the river, the erection of a fine bridge over it, and the laying out of a Government road through the Babylon block to the West Coast having greatly stimulated settlement in that direction. The Babylon block was sold by the Government not long ago at £2 per acre, and was taken up principally by small settlers. The land is of very good character, and is now changing hands at £3 and £4, some of it being held for £6. Some of the settlers intend to commence wheat-growing next season. The new road from the swing-bridge through Babylon to the West Coast, it is anticipated, will become a favourite route with tourists desirous of going to the coast, and of seeing the hot springs and lakes. Considerable traffic that way is expected during the coming summer and parties can ride along the ocean- beach on the sand for over twenty miles at a stretch. An Otago Scotch farmer, Mr. Stevenson, of Balclutha, within the last week or two, has taken up over two thousand acres, and with characteristic energy is losing no time in getting to work. Teams and agricultural implements have been already sent up, and from the smoke on the plain at the time of our visit it was evident he had commenced clearing operations. Perhaps one of the most grateful features to the eye on the landscape in looking from Helensville across the river in the Babylon direction, is the comfortable homestead of Mr. Hay, near the swing bridge, who has settled there within the last couple of years or so, and whose home with its picturesque surroundings is but a type of scores of others which within the next few years will dot the plain of Babylon. 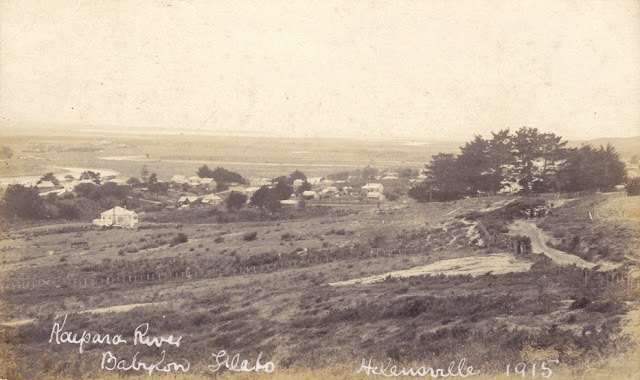 Parkhurst: This district, which, in its original state, was mostly swamp and heavy ti-tree flat, was opened for settlement by the Government in 1880, and has since then made rapid progress owing to its position and the extra good quality of the land. Parkhurst school is about four miles from the township of Helensville, and the road is now metalled most of the distance. Midway is Messrs Ambury and English's creamery, which gets a large supply of milk from those who find that dairying suits them better than fattening cattle. Nearly opposite the creamery are the Hot Spring baths, the development of which only awaits the encouragement of capital and enterprise. From the rising ground there are very pretty views of the Kaipara harbour, and with its advantage of easy communication with Auckland by either road or rail, there are few places in the North Island to compare with Parkhurst. 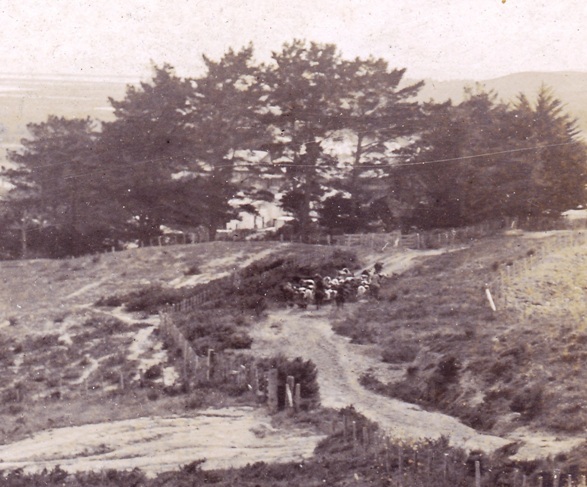 The road going through it terminates at the Kaipara Heads, where Mr. Alfred Buckland owns a large station. Parkhurst is forty-two miles from Auckland, and it has a bi-weekly mail service. Thirty years ago the Babylon Flats were offered to the late Judge Fenton for 2/6 per acre. To-day they are bringing anything from £30 to £35. Exactly why the old hands attached a Biblical title to this particular stretch of country it would be hard to say, but a probable explanation is that, like certain other people, the first-corners “sat down by the rivers of Babylon, and wept." In those days there was plenty of water about Babylon, and the price at which the late Judge refused to become an owner shows the popular estimate of its quality, so it is small wonder if the immigrants were depressed. The name has changed, and though the old-timers still speak of Babylon Flats, the post office and other unromantic officials only know Te Pua, Parakai, Parkhurst, and such like. And the place has changed, too. Now, folk no longer sit down, neither do they weep. They hustle round, and milk, and grow rich, frequently at the rate of £90 a month. The idle cow, lolling in the meadow, is the fairy godmother who has waved the enchanted wand over the scene. They literally live on cream at Babylon. This rich bit of land lies right alongside Helensville —a piece of news which will come as a surprise to those whose knowledge of the district is limited to hearsay, or to a passing visit while en route to the Northern Wairoa. Many aeons ago the far-spreading Kaipara, vast inlet of the Pacific Ocean, must have covered a much larger area than it does now. As it receded, it left behind a deep rich deposit, and the subsequent alluvium from shorewards combining with this has left in the valley lying between Helensville and the ridge of high land which borders the west coast, some thousands of acres, which for dairying purposes could not well be surpassed. By the middle of the 20th century, the name Babylon had drifted north, to the lands near Dargaville. Just an interesting detail from the postcard.